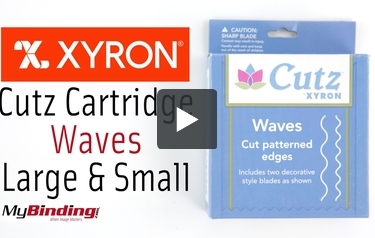 The Xyron Cutz Wave Cartridge for the Xyron Creatopia offers an easy way to cut wavey or pinked edges into fabrics, papers, and other thin materials for all of your home, school, craft, scrapbooking, or whatever else you can create with the Xyron Creatopia. The Xyron Cutz is a versatile rotary cutting system that can cut materials up to 12.5" wide to size or into strips using a variety of Cutz catridges. These Xyron Cutz catridges can produce straight cuts, scoring and perforating, scallops, pinking, and deckle style cuts. This Wave Cutz cartridge easily cuts pinked edges and wavey lines into papers, most fabrics, and thin materials. The Xyron Creatopia and Cutz system makes it quick and simple to get the perfect craft project, holiday card, or other creative project today. Transcript: Welcome to MyBinding Video. These are the Cutz Waves Cartridges Large and Small from Xyron. These cartridges are for use with the Creatopia and the Cutz Starter kit. Just drop them in wherever you need along the tracks, and snap the top lock to make sure they maintain pressure. These two blades cut an oscillating wave pattern. The only difference is the frequency of the wave. This is just one set of many different cartridges. Get a set for your Creatopia today. For more videos and all your binding needs, visit MyBinding.com. Welcome to MyBinding Video. These are the Cutz Waves Cartridges Large and Small from Xyron. These cartridges are for use with the Creatopia and the Cutz Starter kit. Just drop them in wherever you need along the tracks, and snap the top lock to make sure they maintain pressure. These two blades cut an oscillating wave pattern. The only difference is the frequency of the wave. This is just one set of many different cartridges. Get a set for your Creatopia today. For more videos and all your binding needs, visit MyBinding.com.